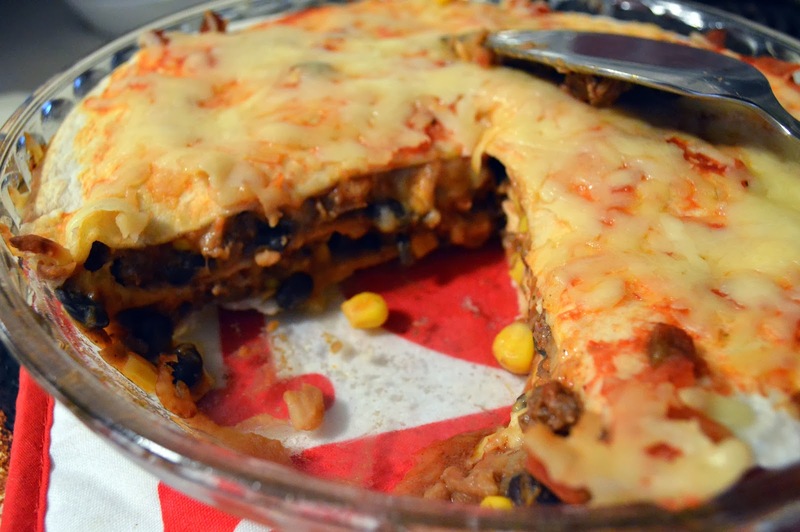 Are you in a dinner time rut? I get that way sometimes. All you need is a little inspiration! 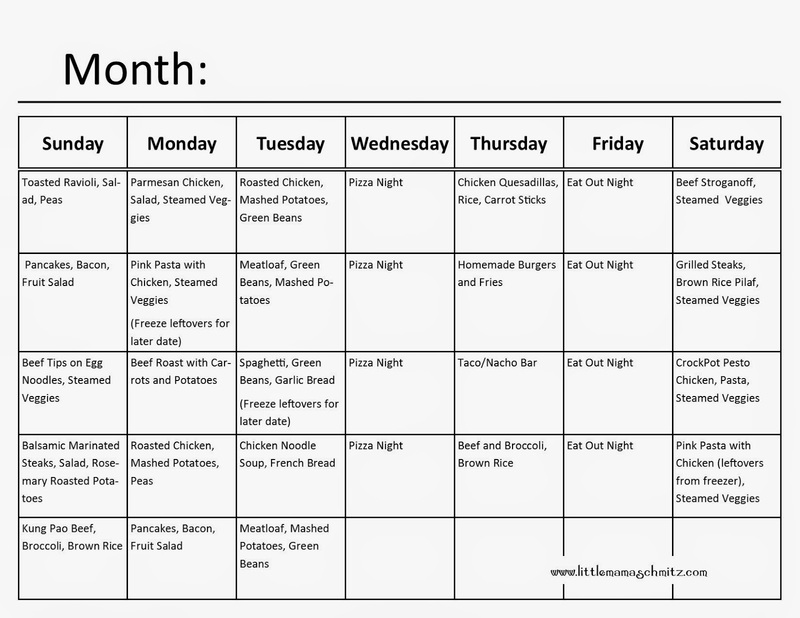 Here is a sample 31 day meal plan. This was actually my menu from the month of January. Side note: "Pink Pasta" is this Creamy Chicken Rigatoni recipe. My sister in law served me her version of this a while back. It was pretty darn yummy, so I decided to make my own version of it! I make my own taco seasoning that can be found here. Combine in skillet: beef, 2T taco seasoning (or half of a store bought packet), 1/4 c plus 2T water, corn and black beans.Simmer until thickened and warmed through. 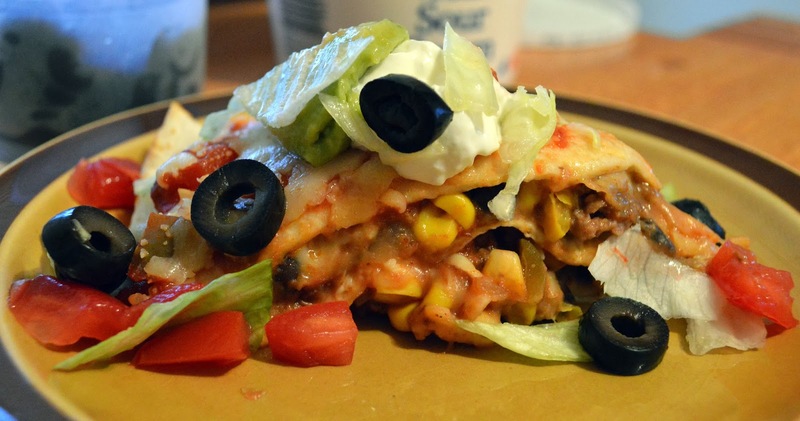 Lightly spray your pie plate with cooking spray, and layer ingredients as follows: tortilla, layer of refried beans, meat mixture, salsa, shredded cheese. Repeat until your pie plate is full. Press down on top tortilla so that it is pressed in tightly. Top with salsa and shredded cheese. Bake, uncovered for about 10 to 15 minutes at 375, or until cheese is melted and bubbly. Allow to cool for 5 to 10 minutes before slicing. Top with your favorite toppings!